Goya: A model for ‘those that don’t succeed, try try again’? Leave a Comment on Goya: A model for ‘those that don’t succeed, try try again’? Francisco de Goya: 18th Century Spanish bad boy? Overlooked Political Commentator? A sufferer for his art? Yes, yes, and yes. Goya is all of the above. Ok, let’s start with the ‘Bad Boy’ charge. This aspect of his personality may be tracked back to his time studying under a master popular with Spanish Royalty of the time. It’s fair to say that he and his teacher didn’t exactly see eye to eye, which resulted in his receiving poor results in his examinations. Later on, he experienced further disappointment when he submitted entries to the Royal Academy of Fine Arts in San Fernando. These were rejected, not once, but twice, in 1763 and 1766. His ensuing fame and popularity could perhaps be taken as a lesson for rejected X-Factor auditionees… or anyone really who has been rejected/rebuffed/had the door slammed in their face. It can still happen! However, this initial period of rejection and disappointment shaped Goya, I believe, to be very independent and perhaps outspoken. Exhibit A: the very daring portrait of Charles IV of Spain and his family. Daring, not in the sense that it was risqué, but rather that it was very politically indiscreet. Art historians today believe that this is an extremely satirical work, as it is thought that this particular portrait was intended to reveal the corruption of the country under the rule of Charles IV. Rumours have abounded that, during his reign, it was actually Charles’ wife Louisa who held the real power. 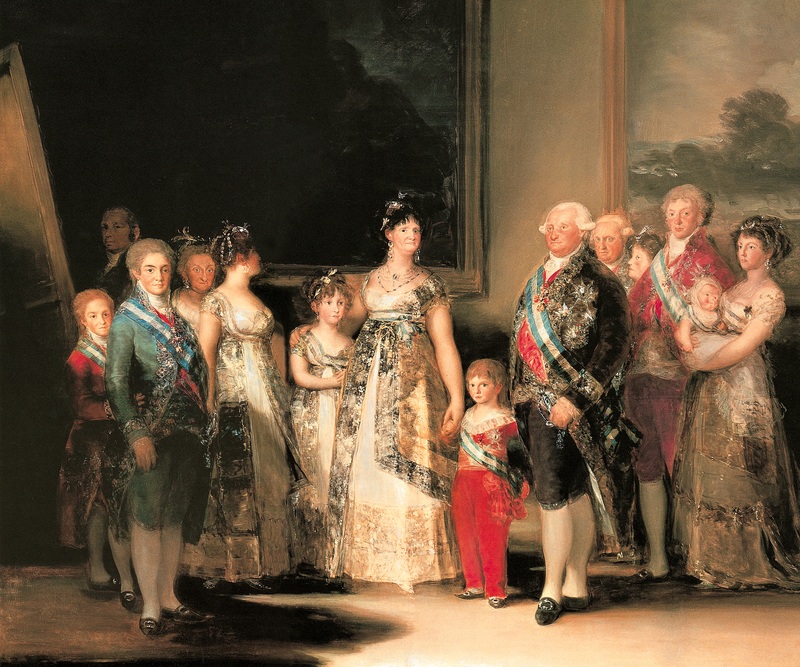 Goya’s portrait seems to confirm this, as he centres Louisa in the middle of the group portrait, instead of the norm of focusing on the King. Such flagrant disregard for rules and etiquette was no doubt intentional, and almost certainly provided some amusement to those dissatisfied with the monarchy of the time. As for suffering for his art, Francisco de Goya suffered acute hearing loss – and in fact became fully deaf – during the period of 1792-1793. There is much speculation surrounding the reason for this, some say that it was due to a series of small strokes, and others blame the lead in the pigments he used – saying that it poisoned him and caused his deafness. 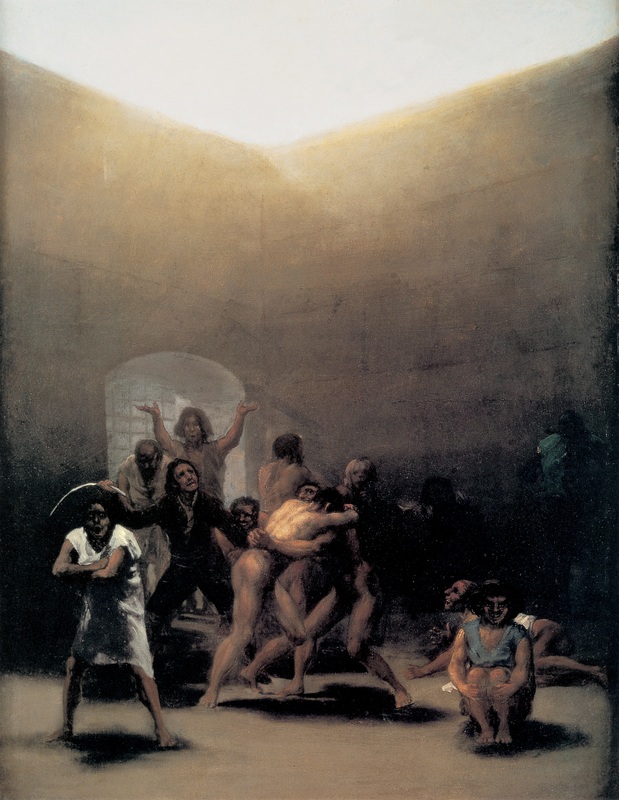 Whatever the reason, it is true that Goya’s temperament changed, and his work became a lot darker. We can date ‘Yard With Lunatics’ to around 1794, directly after he began to experience his deafness, and the difference in the work and the themes are striking. No longer satirical or politically motivated, the work takes on a bleaker atmosphere, channelling the introspective feelings of fear and social alienation of the artist himself. Despite his growing sense of isolation, Goya continued to produce several important masterpieces, including the ‘Black Paintings’ series. So, key lessons to be learnt here: if at first you don’t succeed, try try again. If you do succeed, don’t be afraid of saying what you believe…even if it isn’t popular with the Royal court. You never know, it could well survive and become a talking point centuries later. When met with adversity, face it head on – even if you are a bit more surly than usual, it’s ok, it’s good to express yourself. After all, you may end up like Goya and have a film award named after you (the Goya Awards anyone?). And last, but definitely not least, stay away from lead! Lead poisoning generally doesn’t bode well for anyone. To discover a long line of Spanish artistic genius, you can venture to the New Mexico Museum of Art. The exhibition (from the 12th December 2013- 9th March 2014) focuses on the Renaissance to Goya, so why not discover the inspiration that is Diego Velazquez; an inspiration for artists everywhere, including Francisco de Goya. Take in the changing Spanish style, from Vicente Carduchio to José de Ribera. Discover the thematic differences in the prints and drawings over two centuries. Alternatively, check out ‘Goya’ in Mega Square, written by Jp. A. Calosse. Previous Entry Barock oder Moderne – der Versuch einer Definition?